The blog offers detailed information about Tribes of India. So get ready to explore the different colours of tribes in India,tribal culture, traditions and lifestyle with me. Travelling to India is something I have always cherished. Start counting from tribes of India to India winter sports, India has it all. An Indian tour offers a blend of countless itineraries ranging from heritage, culture, Indian tribes, adventure sports, wildlife and much more. Touring India – the land of origination, is a dream come true for any passionate traveler. Many call it a “destination to stay”, for some its a "leap of excitement". But, the problem arises when we ask ourselves these questions. How to travel India? What places to visit while travelling in India? How to gain fullest from an Indian Tour? Find all the answers to your queries via my posts. In the days to come, I will enlighten you with some of the most unforgettable travelling places of India, the places where people travel in India and also the places where people must travel in India. I promise I will bring it all - tour to tribes of India, adventure in India, culture and heritage of India to Indian wildlife safari. Plug in yourself to my posts, you will feel the thrill of travelling India. Touring India fervently, is my hobby, I want to make it your passion. 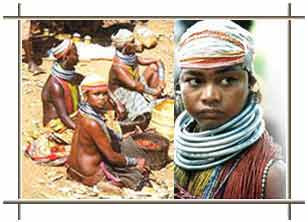 The next destination in the Indian tribal tour is Bangri tribe. These tribes are vibrant and spread all across India. These tribes are largely found in parts of Haryana, Karnataka, Himachal Pradesh, Uttar Pradesh, Punjab and Delhi. Bangaru, member of the Indo-Aryan language family is the prime language.